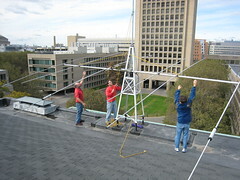 The W1MX HF station is located on the third floor of Walker Memorial on the MIT campus in room 50-358. The station has two operating positions. The primary operating position consists of a Ten-Tec Orion and Ten-Tec Orion II, configured for SO2R operation. 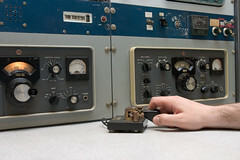 These radios are connected to Henry 2K4 and Acom 2000A linear amplifiers, respectively. The second operating position is a Yaesu FT-2000 and Ameritron AL-1200 linear amplifier. The antennas at W1MX consist of Mosley PRO-96 and TA-36 HF beams, as well as a full-size 160 meter dipole, suspended off the corner of the Green Building (building 54) at nearly 300’ AGL. As contest season comes and goes, the roof of Walker is constantly being rearranged with various receive loops and experimental HF antennas. The antenna system is made complete through an array of antenna tuners (one per band) and a remote switching mechanism that allows for quick band changes with minimal retuning. Gracing the back corner of the 50-358 shack is the Collins S-Line “console”, which served W1MX into the 1980s, though it sees little operation today. Adjoining the station, in room 50-357, is a workshop with benches and some machine tools. It also has a massive collection of W1MX history, in the form of parts and old radios.